We offer Electro Magnetizer with magnetization fixtures made to customer's specifications to magnetize, demagnetize and calibrate magnet systems, for example in electro motors, loudspeakers, sensors etc. Under the supervision of professionals we offer a wide variety of Impulse magnetizer. We bring forth an exclusive range of Electro Magnetizer. 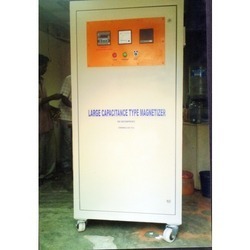 Our offered machine is designed and developed as per the current market technology. Owing to its reliable working operations, it is widely preferred for magnetizing, demagnetizing and calibration management systems in loud speakers and sensors. This offered machine is precision engineered as per the international standards. Looking for Electro Magnetizer ?